The time lapse video of the creation of “Affection”, the chimpanzee mother and baby is now available. I have placed it on the Non Commissioned Gallery page. Very pleased with the outcome of that. Thanks ever so much to Stuart Collins who knows how to do these things, and for the camera to do it! Pretending to be hard at work! I have just arrived at the finishing stages of a wildlife portrait. Whereas I have produced wildlife pictures before, this one, with the help of those more technically adept than I, has been filmed in time lapse (if that is the right way to put it). I have taken a sneak look at the progress and am quite excited. After a bit of editing by the adept it should be fun. I had only just got used to writing down 2017! Christmas commissions complete and so is the first job for the new year, revamping the web site. I hope you approve. Towards the end of 2017 I completed a self portrait. The reason for choosing myself as a subject was to avoid upsetting anyone else. Following the fairly positive feedback I have decided to add people portraits to the range of products available. 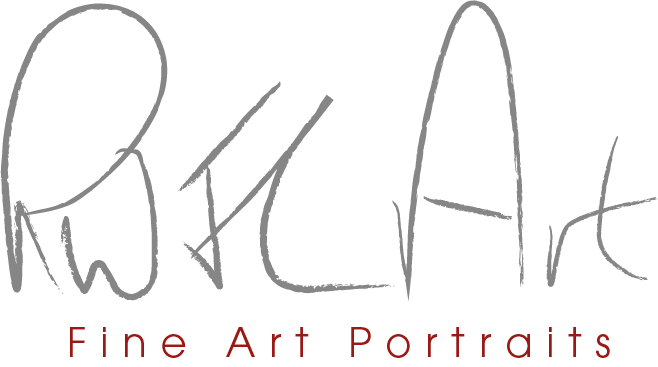 Having spoken to other artists far more experienced and qualified than me I have decided to change my logo underscore from “Animal Portraits” to “Fine Art Portraits”. (There was a suggestion that I change the logo from RWJCArt to RWJCFart but I think we shall overlook that one! During the course of the revamp I will also ensure card versions of prints as well as Christmas cards are available. Although I am not big enough (yet?) to take any other payment than online transfer or cheque. Lastly a belated footnote to say that the Moreton Show was quite an experience. Quite a few cards sold, Christmas and wild animal and commissions taken on. The Show this year is on 1st September. The picture below shows Abi and Phoebe manning the stand in my absence. Following the confidence gained from exhibiting on a small scale I have decided to go to completely the other extreme! On 2nd September I have a stand in the ‘Crafts Marquee’ at the Moreton in Marsh Show, one of the biggest in the country. On 17th June 2017 I attended the Coates Village Grande Fiesta, just outside Cirencester. It was very hot work setting up and I’m grateful for the help of Shaun. However once settled in it was possible to enjoy the show and relax. Thank you to all of those that attended my stand. I hope you enjoy the cards and to those enquiring and taking business cards I look forward to being able to produce images of your pet or the pet of people close to you. Please allow plenty of time. I am, after all, retired!